Here is a not-so-short story about Short Stories! We get many types and varieties of pre-cut fabrics, but by far the #1 choice is the "Charm Square Pack". If you are unfamiliar with this concept, just hang around a quilter for 10 minutes and you will probably hear a reference to "charms" or "charm pack". These are terms that have become associated with a stack of 5" squares, stemming from a stroke of brilliance on the part of some clever marketing person behind the scenes at Moda Fabrics. As far as I can tell, this is where the packs originated. They became a good method to capture a little bit of all of the fabrics within a specific design collection, usually upwards of 25 prints coordinated around a theme. I'm not totally sure of why they picked this name, Charm, but I think it might go back further in the history of quilting. 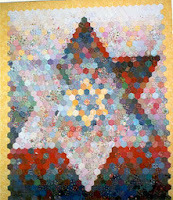 There is a group or type of quilts called "Charm Quilts" or "One Patch Quilts". The distinction of these quilts is that they are made entirely of one shape (square, triangle, hexagon, etc.) and very often with no repeated fabrics. The makers of these quilts often carried on a lively trading habit with friends and strangers to acquire so many different prints. If you have any old quilting magazines, I mean really antique like from the 70's, you will find little ads in their "classified" section, making a request for anyone to send squares or scraps of a certain size to someone wanting to add to their charm quilt fabrics. Fast forward to the present, when the charm square quilt can take on many more meanings, but usually centered on the concept of the 5" square and parts thereof. Not sure where the arbitrary measurement of 5" came from, but it seems to stick. Usually these packs are diecut by the manufacturer, and come to us all neatly stacked and fastened together with a label of some sort identifying the maker/designer. They usually contain 42 squares in the Moda packs, but the numbers can vary by manufacturer, so be alert to that if you are shopping. And the price will reflect that. There are those among us who love to collect fabric, and picking up these little charm packs has created a whole new opportunity for collectors! Often, we fall in love with a certain group of fabrics from a designer, and would love to have it all. But with fabric groups composed of 30 and often more prints, that can be real hard to buy even 1/4 yard of each. Enter the amazing charm pack that lets you own a little bit of each one! 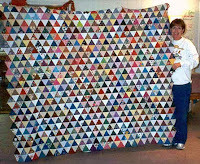 The patterns that have been written to make good use of the 5" squares have proliferated and offer many choices. But you really don't have to make anything with your collection, they can be perfectly fine just stacked with their friends in your fabric stash, just perfect for dreaming and planning for that next perfect quilt! One of our favorite fabric companies is Anthology Fabrics, especially for their wonderful richly colored batiks. (For a quick refresher on a popular blog post about batiks, click here.) We have just received in some new charm square packs of their assorted batiks, and these would be a wonderful addition to your collection! 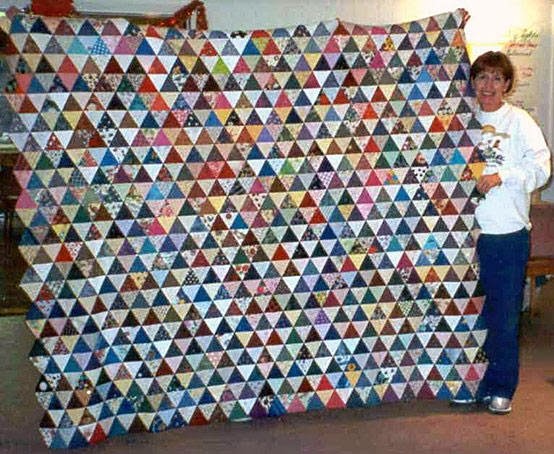 They call their collections "Short Stories", because every quilt tells a story. FYI, they are also running a competition for some great prizes if you have made a quilt with their pre-cut fabrics and yardage. However, the deadline is 12/15/13, so there is no time to waste! The back of the pack shows each of the colors it contains. They are all nicely encased in a plastic wrapper, which we love at the store because the fabric dust that results from all of those cut edges really adds up! If you are looking for a great way to store your own treasured charm squares in the style they deserve, these little ArtBin boxes are perfect! They also make a super gift idea for a fellow fabri-holic, filled to the brim with 5" squares! And Christmas is just around the corner, so instead of making your quilting buddy a quilted gift, just give her the box full of squares and let the creativity go wild!